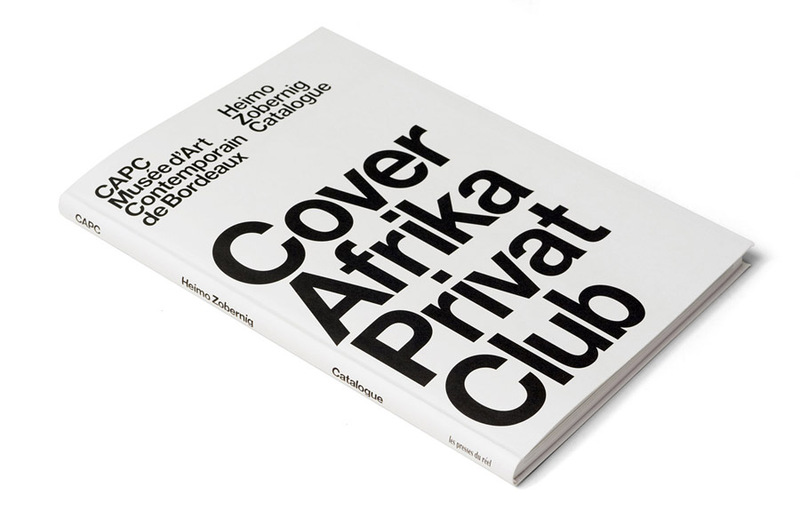 In 2009, we were approached by CAPC, the Museum of Contemporary Art in Bordeaux (France), to design the printed matter surrounding an upcoming exhibition of Austrian artist Heimo Zobernig. This exhibition would take place between May 16 and August 16, 2009. 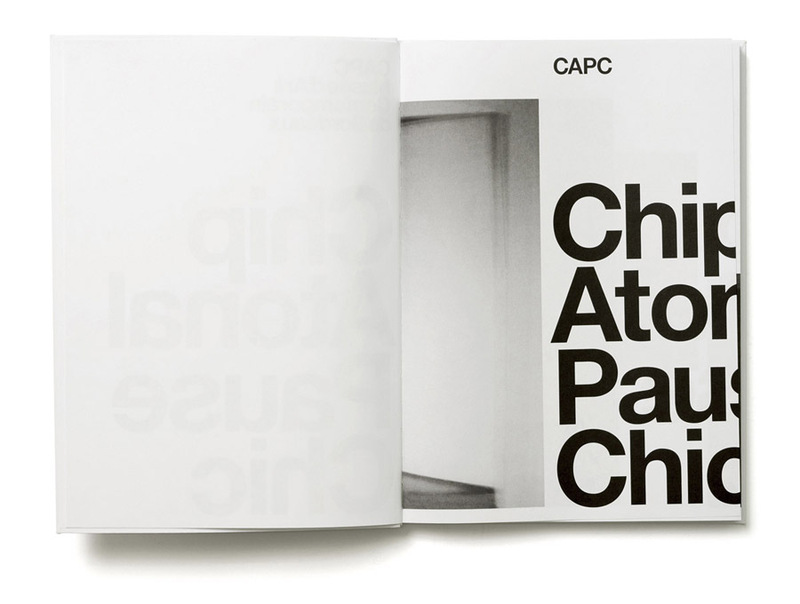 What's interesting to note is the fact that, around that time, CAPC didn't have an actual graphic identity – they didn't have a logo, or any other recurring visual themes; at that time, they didn't even have a website. This was a deliberate choice from the side of CAPC. 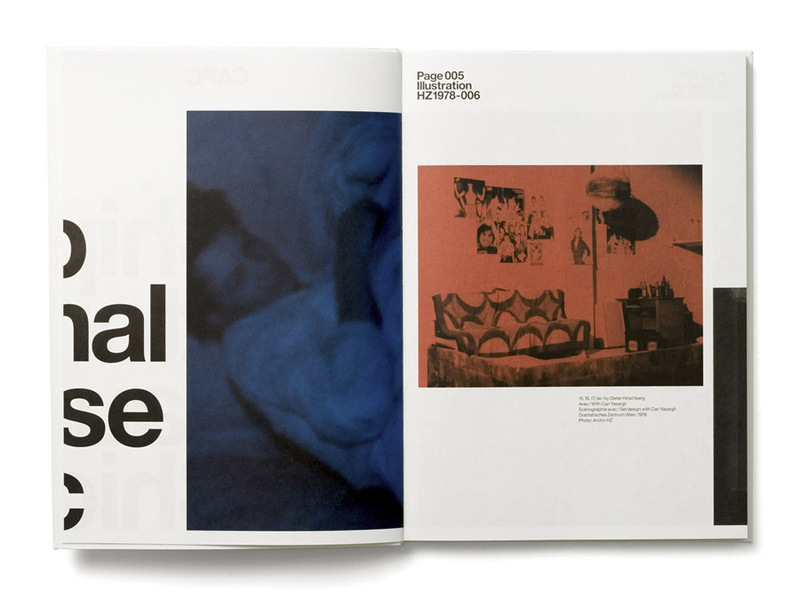 The way they saw it, the string of exhibitions (with the printed matter of each exhibition created by a different designer) would provide its own organic graphic identity: a constantly changing identity, shifting from designer to designer. In other words – the printed matter we would design for the Heimo Zobernig exhibition would also have to function as a temporary graphic identity for CAPC. 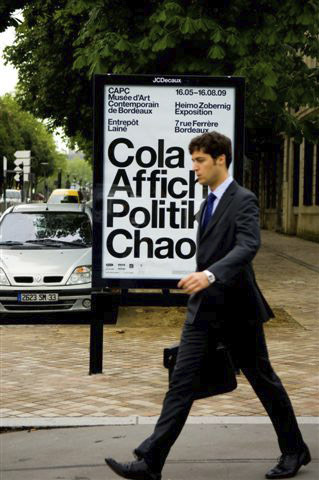 Our main challenge then, was to connect Heimo Zobernig with the CAPC. And while we were thinking about that, we realised we had no idea where CAPC actually stood for. We were talking about it with Heimo, and he had no idea either. Sure, we could have asked the museum, but we intuitively knew that the mystery surrounding the acronym CAPC might be something we could use, within the context of a possible graphic identity. At the same time, we were going through all the material Heimo provided us with – a large number of books, and also a couple of online texts. Reading these online essays, we actually came across a paragraph referring to acronyms for contemporary art institutes: in 'The Crystal Soul of the Modern Museum', (Vitus Weh, 2005), the writer describes acronyms such as MOCA, MUCA, LACMA, MACBA, MOMA and MAMBA as "infantile mumbles and stammers" – an observation we don't necessarily agree with (we actually like the ambiguity and graphic stutter of acronyms), but one that we found interesting nonetheless. (Just for clarity; the book shown above wasn't designed by us – we're only showing this to explain the overall concept). So while thinking about this alphabetical list, and about this rather mysterious acronym CAPC, we suddenly realised what we had to do. We took the acronym CAPC, and 'injected' this acronym with words borrowed from the 'Lexikon der Kunst'. 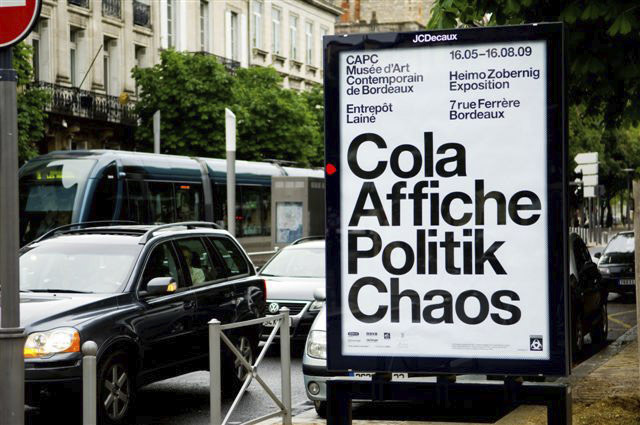 In that sense, the acronym CAPC would be literally 'filled' with Heimo's words, in a perfect analogy with the way the building of CAPC would be filled with the Heimo's work, for the duration of the exhibition. An example of this principle its shown below. 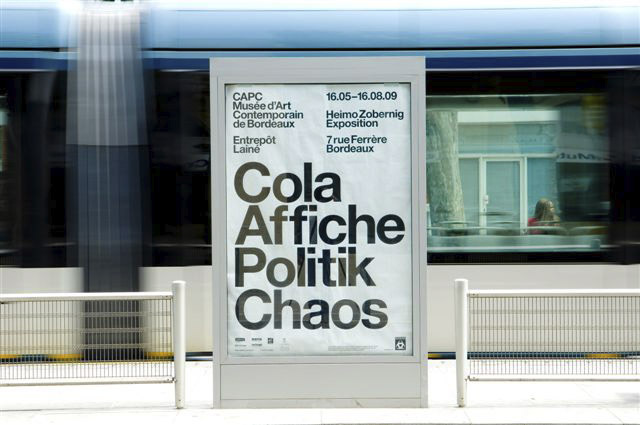 On this (mupi-sized, screenprinted) poster, the acronym CAPC is filled with the words Cola, Affiche, Politik and Chaos; all words coming from the 'Lexikon der Kunst'. To this, we added the concept that each time the acronym would appear on a piece of printed matter, the used words had to refer to the actual piece of printed matter itself. For example, on the mupi-sized poster (see above) we used the word 'Affiche', on the front of the invitation we used the word 'Card', on the A2-sized poster we used the word 'Plakat', on the front of the catalogue we used the word 'Cover', etc. (Again, all these words were taken from the 'Lexikon der Kunst'). The invitation consisted of an A2-sized poster (offset-printed on both sides), folded to an A5-sized brochure. On the front of this brochure, we put the words 'Cola, Aktion, Physik, Card'. This invitation first unfolds to reveal a spread, containing all the necessary information. 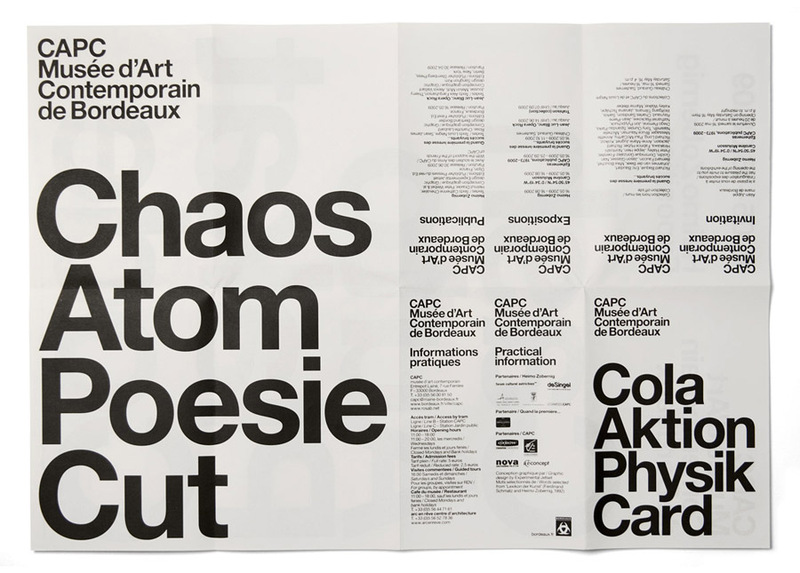 Unfolding this invitation even further, you then come across an A3-sized mini-poster, displaying the words 'Chaos, Atom, Poesie, Cut'. 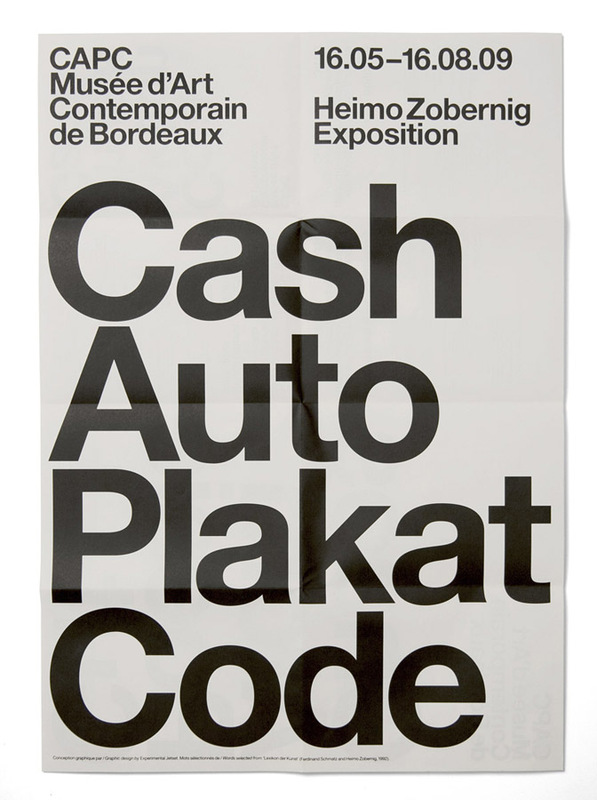 The invitation finally unfolds into an A2-sized poster, showing the words 'Cash, Auto, Plakat, Code'. In the words of Les Presses du Réel: "Interacting with the artist's editorial praxis, they [Experimental Jetset] present the works in chronological order, but with a quite specific visual treatment under the form of an evolving chromatic sequencing, introducing a cinematic effect – a kind of visual and philological emanation of the chronology. 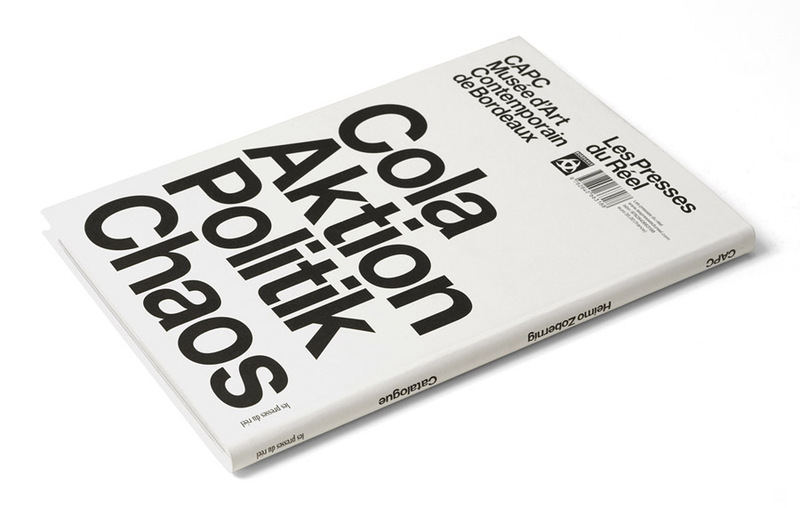 The book also gathers a selection of 'historical' texts (Helmut Draxler, Klemens Gruber, Monika Meister, Juliane Rebentisch, Peter Weibel, Heimo Zobernig) and new essays, specifically written about the issues of theatricality and display (Yann Chateigné Tytelman, Catherine Chevalier, Moritz Küng, Diletta Mansella)". The catalogue (bilingual, A4-sized, 224 pages) was offset-printed by Tienkamp & Verheij (Groningen). More information can be found on the website of Les Presses du Réel. First of all, we'd like to thank Heimo Zobernig. When we went to Vienna (to discuss the project), he showed us both the Sigmund Freud Museum, and the Haus Wittgenstein; such a perfect introduction to the city. Furthermore, we'd like to thank Charlotte Laubard, Catherine Chevalier, and the rest of the CAPC staff.